Toyota has revealed a new plug-in hybrid is to join its Prius line-up, with the model bringing its own style to the table, and even more impressive economy stats than the ‘conventional’ Prius. It’s aimed to take on the likes of Hyundai’s new Plug-In Ioniq, Mitsubishi’s Outlander PHEV and the BMW i3. The key difference between the conventional hybrid Prius and the Plug-In is that the PHV is capable of covering 31 miles on electric power alone, thanks to an extra 8.8kW lithium-ion battery that can be recharged from empty in around three hours. The Prius Plug-In mirrors the silhouette of the standard car, but in the flesh it looks different from almost every angle. The most notable external change is at the front, where a smoother grille and new bumper give the PHEV an excellent drag coefficient of 0.25. Whether or not you think this improves the already divisive look is up to you. Other changes for the plug-in model include an updated suspension to provide better road-holding and ride quality in light of the car’s larger, heavier batteries. The roof is also rather special, featuring optional solar panels that can increase range by up to three miles. When the vehicle is parked,but not plugged in, the roof can charge an intermediate solar battery that’ll deliver a boost to the main hybrid battery when it’s fully charged. Toyoto claims it is a world first. The same 1.8-litre petrol engine is used, although acceleration and top speed are slightly more sedate than the non-PHV Prius. It can reach 62mph from rest in 11.1 seconds and go on to 100mph, but selecting EV mode and you’ll be limited to 84mph. As such, the Prius PHV is capable of up to 282mpg according to official NEDC tests, but it’s worth bearing in mind that these figures are unlikely to be attainable in real world conditions. But the improved aerodynamics and long distance EV-only range will make it more frugal than its conventional sibling. 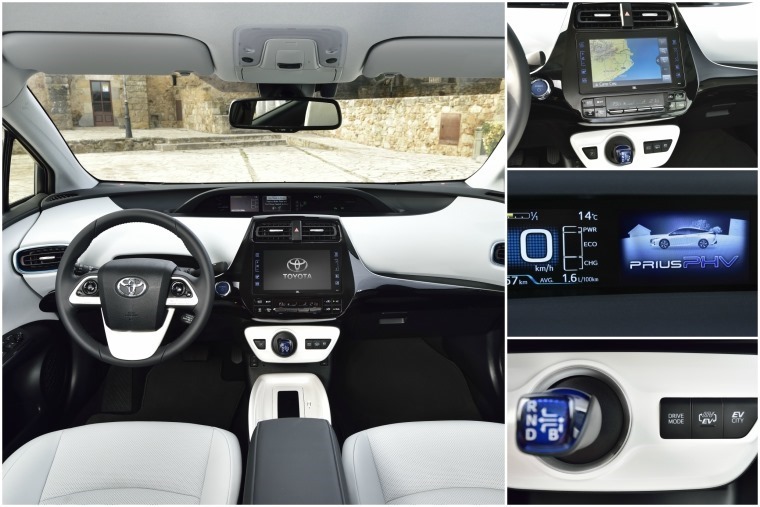 The Prius PHV also benefits from extra sound proofing, wireless charging, Intelligent Parking Assist as well as Toyota’s latest safety pack which includes Pre-Collision Assist and Adaptive Cruise Control. Available in the UK in two specifications – Business Edition Plus and Excel – the Prius Plug-in is priced from £34,895, but lease prices are yet to be confirmed. It will be available later this year but, if you can’t wait until then, here’s some great lease deals on the conventional Prius.